Updated Mid-Century Modern Beauty with Private Pool, Golf Course & Mountain Views! Spectacular Home! This stunning home has been professionally furnished and decorated throughout and is located in one of the most sought after areas in the desert. 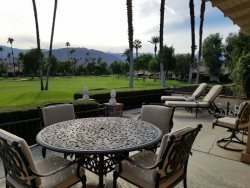 Featuring golf course and mountain views, this Indian Wells pool home is located at the end of a very quiet cul-de-sac and is just steps from the Miramonte Resort and Spa. A renovated mid-century beauty offering 2,100 sq ft of luxurious indoor/outdoor desert living. With a spacious great room for entertaining and 3 Bedrooms, 4 Baths, this home is a perfect fit for family vacations or extended seasonal stays. The great room offers two separate entertaining spaces; one with seating around a beautiful fire & ice gas fireplace, and a second appointed with cozy furnishings surrounding a huge mounted flat-screen TV with DVD player, stereo and the works! The views are straight out of “House Beautiful.” The entire back of this home is wall to wall, floor to ceiling glass, filling the home with light and sunshine and overlooks the spacious back patio, pool, golf course and mountains beyond. Simply gorgeous! Back inside you’ll find a fully updated custom kitchen with high-end stainless appliances, ample storage, work-space and all the supplies and kitchen gadgets you’ll need to prepare even the most elaborate dinners. A separate dining area off the kitchen seats six or enjoy casual dining or visit with the cook at the kitchen bar, with stool seating for three. There are two bedrooms inside the home and a third private bedroom in an attached casita off the gated courtyard. The master suite has wall to wall glass and French doors leading to the pool side patio. Furnished with a king bed, luxurious bedding, dresser and closet space galore, a comfortable chaise lounge and a large flat-screen TV, what more could you ask for? How about a fire & ice fireplace to lend just a touch of romance to this perfect bedroom retreat. Guests will also enjoy the updated master on-suite bathroom with double vanity and walk-in shower. The guest bedroom has been furnished with a king bed, luxurious bedding, ample storage space, a large flat-screen TV and a convenient computer desk. Originally two twins, the owners have outfitted the bed with a twin-to-king kit and thick mattress pad making it into a comfortable king. Additional bedding has been provided for two twins if this better fits guest’s needs. Wall to wall windows and glass door has outside access and leads down the side of the house to the pool area. The private on-suite bathroom has a single vanity and shower/tub combination. The third bedroom is located in a private casita within the entry courtyard. Furnished with a queen bed, plenty of storage space and an on-suite bathroom with single vanity and walk-in shower, this attached casita offers guests separated privacy from the main house and is just steps to the built-in Jacuzzi spa. We are certain most of your time will be spent on the pool side patio! Surrounding the beautiful custom pool is quality patio furnishings perfect for lounging in the sun, entertaining in the outside living area or dinning al fresco. Whether enjoying a beautiful desert sunrise, watching golfers play through in the distance, paddling around the pool or lazing in the sun, you will love the outdoor living this home provides. In addition, the back patio has a fully operating misting system for those toasty days and to add to the ambiance, there is a relaxing water fall on the North side of the patio. Lighted ceiling fans run the length of the covered patio to further cool down temperatures when needed and gives ample light for enjoying the patio after dark. And won’t your family chef love this … he/she can cook for a small army on the super-size natural gas barbeque station with four cooking burners! Other amenities of this home include skylights and spots throughout bringing in lots of sunshine, stone floors in the living spaces and thick high-quality carpeting in the bedrooms, a forth full bath with easy access to the pool, rolling shutters on all windows and around the back patio, for security as well as shutting out the light when not wanted, indoor laundry room with front load appliances, the single car garage is locked and not available for guest use, but the large circular driveway provides plenty of parking space for three or four cars, Wi-Fi, cable channels and land lines that provide free local, US and Canada calling. Guests will enjoy the close proximity to the Miramonte Resort & Spa, just steps from the front door, with public access to dining, entertainment and spa services. This home will consider a small dog with pet fee, but please inquire first for owner pre-approval. Also note that the back patio is not fenced and walks directly, through landscaping, to the golf course, so little ones, whether two or four legged, will need to be supervised. Tenants Pay Pro-Rated Gas and Electric for pool heating in the cooler months and A/C in the warmer months. This perfect home is what desert living is all about! Garage is not available. Parking in driveway only. Knowledgeable, helpful and thoroughly professional. It was our first time in the Coachella Valley. The quality of the premises and our your services, coupled with a direct flight from Winnipeg and the ability to bring our dog, would be strong factors in favor of a return visit.